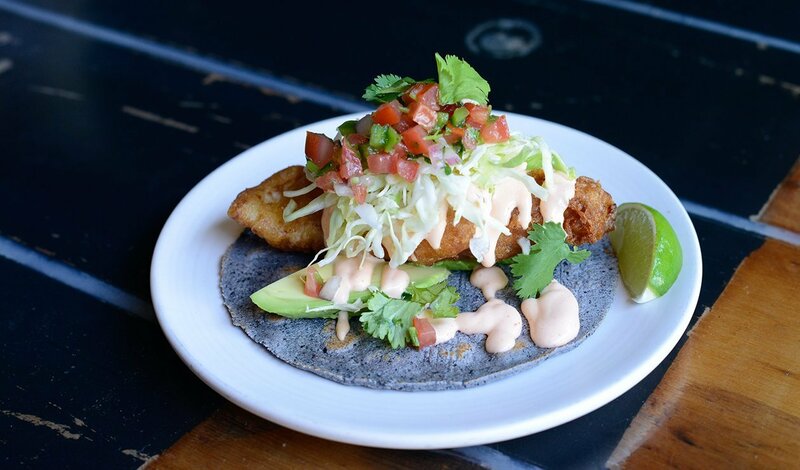 Beer battered fried fish tacos are topped with crisp cabbage and creamy chipotle mayonnaise. In a large bowl combine the flour and spices by hand until well incorporated. Set the bowl on a kitchen towel and slowly whisk in the beer to ensure a smooth clump less batter. Dip the fish in the beer batter. Mix the Hellmann's® Real Mayonnaise with the Ancho Chipotle Hellmann's® Sauce. Have the tortillas warm and ready to assemble. Place one of the fish fillets in each tortilla; add a spoonful of the Chipotle Mayonnaise and one spoonful of cabbage. Serve the tacos immediately with the salsa mexicana and the lime wedges. Note: if you prefer a green salsa you can use salsa verde cruda.